Show me your axe racks! Discussion in 'Edged Tools' started by badgerthehobo, Jan 26, 2015. Not sure if this goes here or over in self made...mods, please move it if i'm wrong. 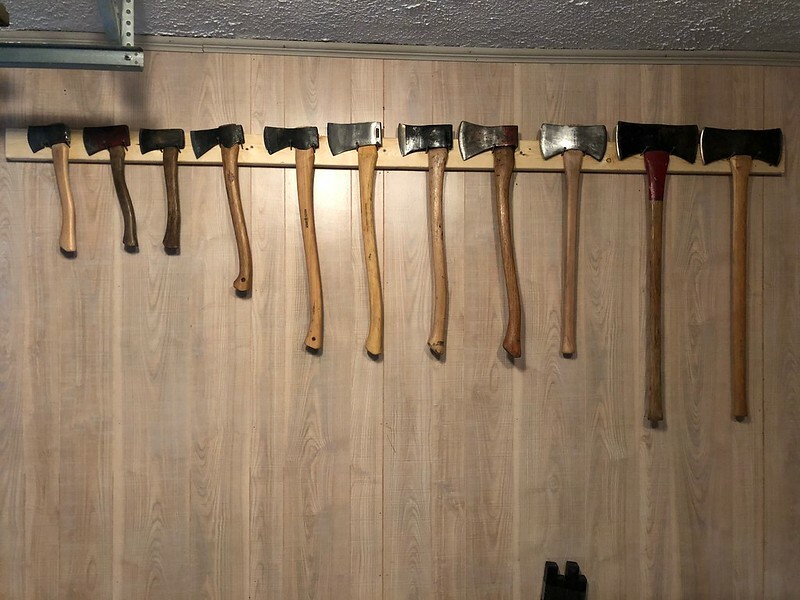 My axe collection has been growing as of late, and I am looking for a creative way to store/display them. right now I just have them hanging from baling twine in my shed. Show me what you've got! 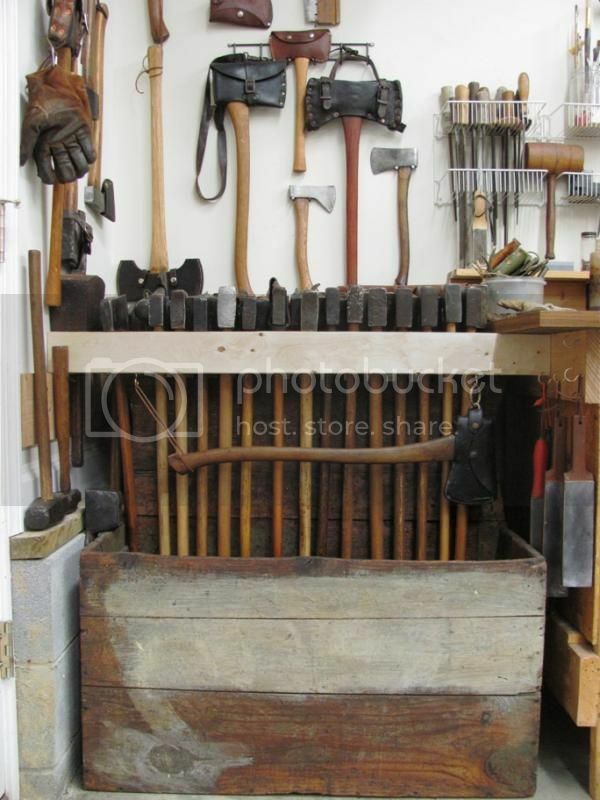 The majority of my tools used to live in a shed but the rust on saws, mold on handles, even the occasional wood worm eating handles and enough was enough. The humidity would literally have my oiled handles covered in mold in no time. 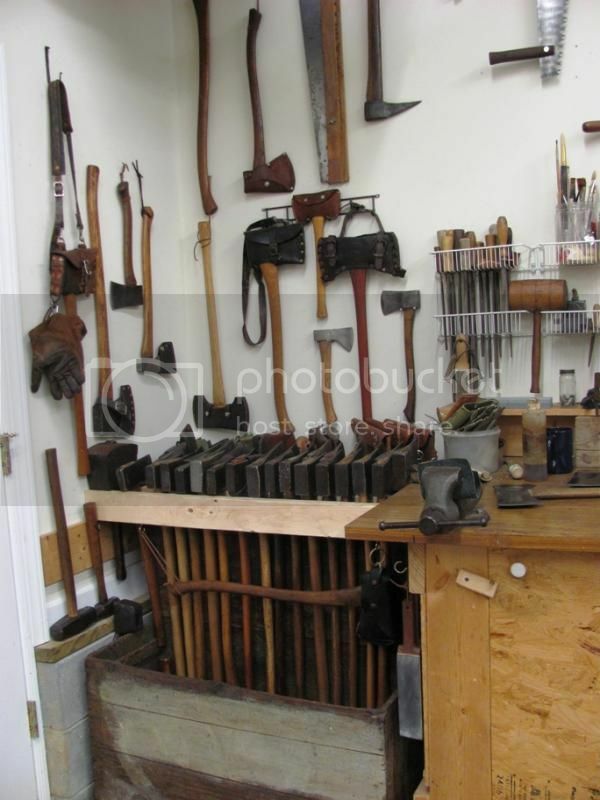 All my loved tools moved inside. I have not had any problems with them drying out but I keep them well oiled, especially the wedges. I just used some 2x4's screwed between one end of one of my workbenches and the wall. 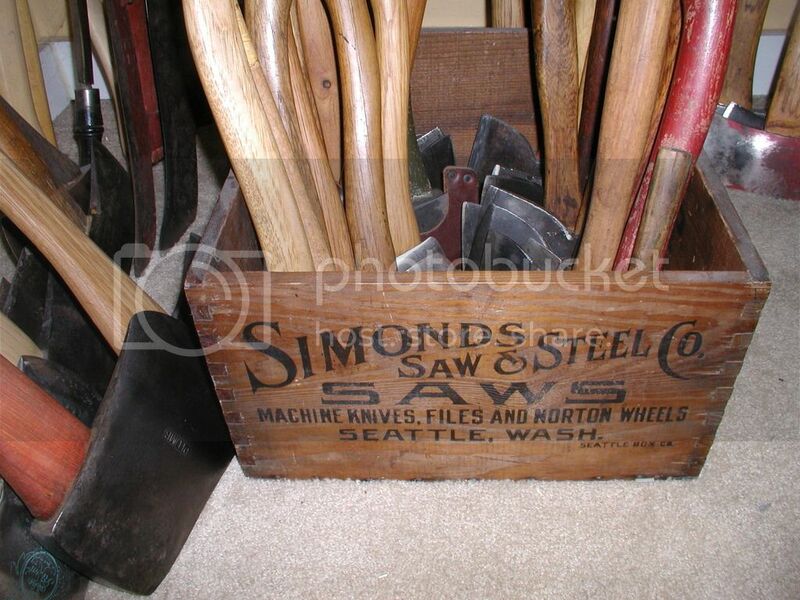 And old wood box holds a chainsaw, wedges, chain, hammers etc..
CaptCrunch, leightyj2, Turtle Creek and 37 others like this. Here is one I made. It takes one 8' 1x12, two 8' 1x4s, one 8' closet rail, screws, and nails to hold the rails in place. About $20. 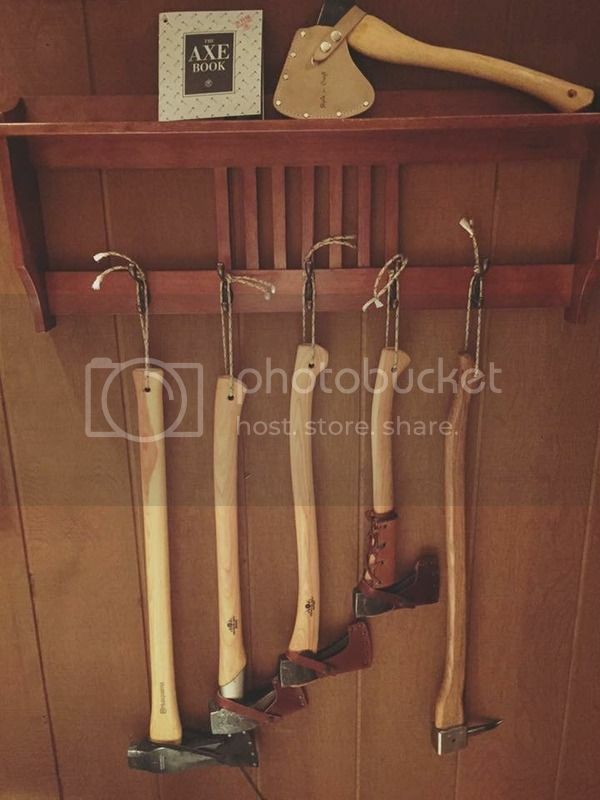 I installed shelves in between the studs of a basement wall and put in a hatchet rack. Danmanrn, Turtle Creek, Gruxxx and 22 others like this. Turtle Creek, chndlr04, Mjolnir and 11 others like this. Turtle Creek, Bryan King, chndlr04 and 7 others like this. I just have my axes leaning in a corner out in the shed. I only have a full size double bit, a full size single bit, a boys axe, and now 2 hatchets. I don't have room for an axe rack. I'm following this closely. Currently my axes are hanging from nails in my workshop, but I feel its' time (now that I have 20+), to build a rack to properly house them. Haggis and TJC like this. I have some of mine displayed on the walls of my log house but most I set in the square plastic milk carriers. Turtle Creek, actichy, Mr. Tettnanger and 17 others like this. Wow, those are great shots of your collection Larry. Really like the knives too! Haggis and Bax 40 like this. Bax 40 and Haggis like this. Seriously...makes my meager "collection" not a collection! Turtle Creek, OldFatMan, Bax 40 and 1 other person like this. I'm gonna have to step up my game if I'm gonna hang around you guys. OldFatMan, Bax 40 and Haggis like this. Your wife must have one hell of a shoe/purse collection! Bax 40, gwynn1975, WILL and 1 other person like this. happywanderer, Miller White, Bax 40 and 2 others like this. I just put these together yesterday, One for axe,s one for hatchets. They were both made out of scrap pallet wood. A little sanding and some stain and should make pretty good storage. Mr. Tettnanger, Malpaso, Forestree and 11 others like this. Forestree, Bax 40, Haggis and 1 other person like this. I just bought an antique wood box and put all mine in it. Miller White, Bax 40, gwynn1975 and 2 others like this. Dualsport225, Bax 40, WILL and 1 other person like this. I did have a few on the wall. After seeing these I may hang a blanket over them in shame. Miller White, Bax 40 and Haggis like this. CaptCrunch, Turtle Creek, Mr. Tettnanger and 15 others like this. Gii shi kan dug, Bax 40, WILL and 2 others like this. OMG! My jaw just hit the floor. OldFatMan, Bax 40, weltondl and 1 other person like this. chndlr04, OldFatMan and weltondl like this. I don't have open walls clear enough for racks. and the lean-to on the barn. I didn't collect them like it seems many of you all did , Most were given to me .Much of my dads collection. I think I bought 3 my whole life. They are not show pieces, their just tools. Most are antiques and laden with their own history. I don't throw the broken handles away, I re purpose them. happywanderer, Gii shi kan dug and garry3 like this. Turtle Creek, Mr. Tettnanger, americanstrat98 and 2 others like this. I bought this coat rack for $5 at a garage sale. Turtle Creek, Mr. Tettnanger, ugar-6 and 4 others like this. Reviving an old thread with a few of my axes and hatchets. Northwest Axe, Turtle Creek, Mr. Tettnanger and 9 others like this. garry3 and Madwell like this. garry3, Falcon45, Turtle Creek and 9 others like this. Not exactly a "rack" but I found this idea somewhere in the internet (possibly this forum...can't recall exactly where I saw it). I tweaked it a little for my purposes. These plywood cable spools get thrown out into dumpsters by the hundreds everyday at construction sites across the country I'm sure. When I was working a construction job I grabbed one and took it home. Sawed out rounded slots radially and used hook and eyes screwed into the outside face to retain anything that might rattle out of place as I roll it around the basement on the caster wheels I screwed to the bottom (yes, I know screwing parallel to the plywood layers is not ideal, but for this application it should be good enough). A coat of polyurethane to seal the surfaces. Voila. A few of my crude, basic but serviceable waxed leather axe masks are to be seen in photos...as well as the sawdust mess I was making while building an insulated door for my basement. Pardon the mess! garry3, Turtle Creek, Madwell and 10 others like this. I like the spool idea. 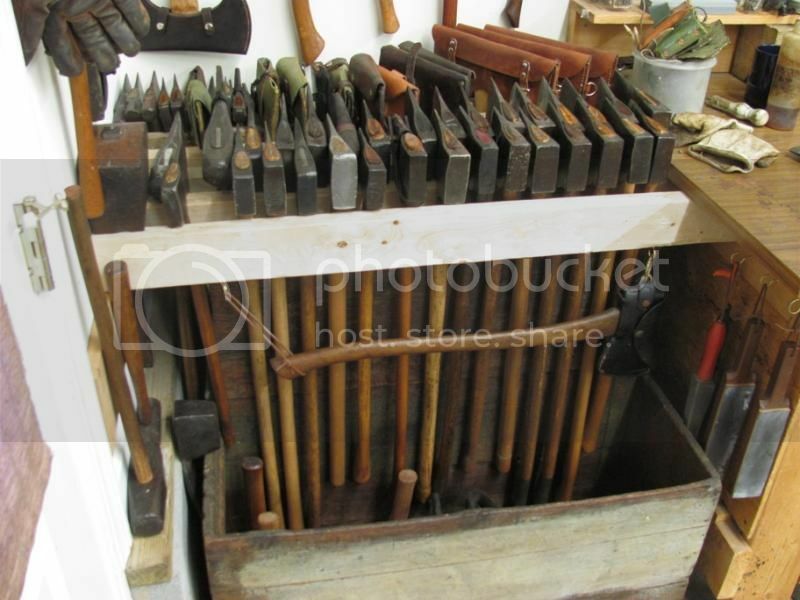 The only thing I'd change would be to get one of the big spools with the wooden core (not sure if yours is wood or cardboard) and cut slots in the core for the bits to go into. With my luck my wife would chop off her toe if I stored my axes blade-out, lol. Madwell, americanstrat98, UAHiker and 1 other person like this. Madwell, Ptpalpha and UAHiker like this. You fellas have some nice setups. I'm about hard as Portland cement right now looking at all the pronagraphic axe displays. A nice, functional display is high on my to-do list 'cause the pile-o-axes on the basement floor is somewhat lackluster. Madwell and Ptpalpha like this. Looking at this thread makes me feel ax-poor. Made from scraps and repurposed boards. Ptpalpha, Turtle Creek, Mr. Tettnanger and 8 others like this. How in the world do you choose? I think I'd develop a twitch trying to make a decision. I don't have that many. I use nails in the shed alot. By my wood stove in living room I have double side coat hook. Looks nicers. On my wood box I have bunch of coat hooks for various things. Not cheap as nail, but quick. I feel bad... I have a piece of cordage strung along the bottom of the lowest 8' shelf in my gear room. every foot or so, i just tied an overhand knot to make a small loop. my hatchet handles stick through the loop and just hang there... too ashamed even to show pics. at my old place i just stood them in the corner. Turtle Creek, Mr. Tettnanger and Forestree like this. Here is about 2/3 of my axes. The nicer ones anyway. Mounted on thick pegboard with some of my bow saws. garry3, Ptpalpha, Turtle Creek and 6 others like this. garry3, Falcon45, Ptpalpha and 7 others like this. garry3, Ptpalpha, Turtle Creek and 3 others like this. 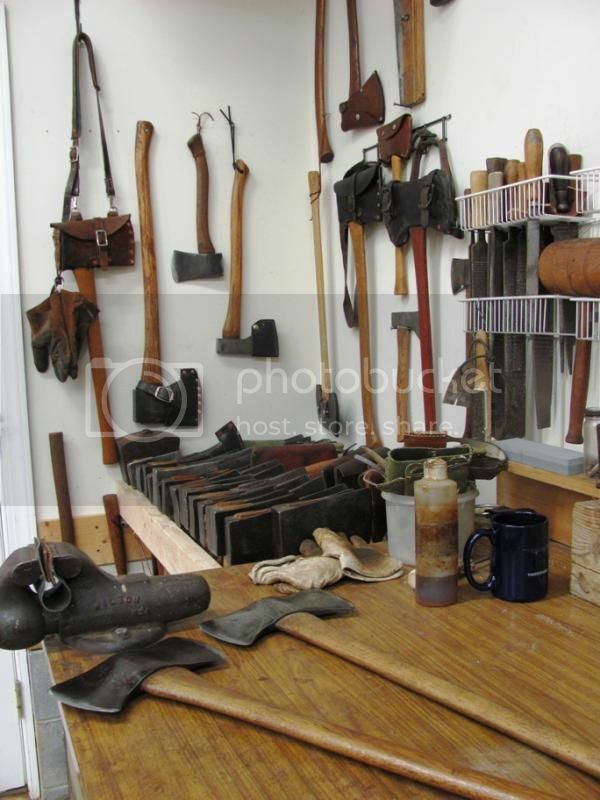 Y'all have a lot of axes! Im pretty jealous right about now. I need to step up my axe game! It's the heavy cardboard core, not wood. I just used what was available at the job site dumpster. I have one good shed outside stuffed full. I brought these guys in and cleaned them up a bit and inspired by this thread I put up a butcher block shelf in the man cave and drilled some holes in it. TomJ and cek like this.